Draft: 2010, Chicago White Sox, 1st rd. Full name is Christopher Allen Sale ... He and his wife, Brianne, have 2 sons, Rylan and Brayson ... Signed by Jose Ortega (White Sox) ... Pitched at Florida Gulf Coast University from 2008- 10 ... His number (41) was retired by the school on 1/31/15 ... Named 2010 National Player of the Year by Collegiate Baseball after going 11-0 with a 2.01 ERA (23 ER/103.0 IP) ... Named by Baseball America as the No. 1 prospect in the Cape Cod League in 2009 after going 4-2 with a 1.47 ERA (9 ER/55.0 IP) and 57 SO for Yarmouth-Dennis ... Graduated in 2007 from Lakeland (FL) High School ... Selected by COL in the 21st round of the June Draft, but did not sign. Went 12-4 with a 2.11 ERA (37 ER/158.0 IP) over 27 starts during his 2nd season with BOS ... Posted a 13.50 SO/9.0 IP ratio, the highest mark ever among pitchers with at least 150.0 IP ... Named an All-Star for the 7th straight season...Was the AL's starting pitcher for the 3rd time in as many years ... Named Red Sox Pitcher of the Year by the Boston Baseball Writers ... Fell 4.0 innings shy of qualifying for the ERA title ... Was on the 10-day disabled list due to mild left shoulder inflammation from 7/28-8/11 and 8/15-9/10 ... Struck out 237 while issuing just 34 BB ... Became the 7th AL pitcher ever with 200+ SO in at least 6 consecutive seasons ... Limited opponents to a .181 AVG while posting a 0.86 WHIP ... Both marks trail only Pedro Martinez in 2000 for the best in Red Sox history (.167, 0.74) (min. 150.0 IP) ... Recorded MLB's longest scoreless streak (35.0 IP) and longest homerless streak (74.0 IP) of 2018 ... It was the longest scoreless streak by a Red Sox pitcher since Pedro Martinez in 2002 (also 35.0 IP) ... Was rated the AL's best pitcher in the annual Baseball America Best Tools survey, which polls managers, scouts, and executives ... Was also rated as having the AL's best fastball and best slider ... Honored as the AL Pitcher of the Month for June and July ... Is 1 of 2 Red Sox ever to be named Player/Pitcher of the Month in back-to-back months, joining Pedro Martinez in 1999 (April, May) ... In 11 starts against the AL East, went 6-0 with a 1.85 ERA (13 ER/63.1 IP), 0.75 WHIP, 95 SO, and just 15 BB ... Tossed 6.0 1-hit, scoreless IP on Opening Day (3/29 at TB) ... The last pitchers to throw 6.0+ scoreless innings and allow no more than 1 hit on Opening Day were Clayton Kershaw (2016), Sonny Gray (2015), and Kevin Brown (1997) ... No other Red Sox have done that since 1908 ... Allowed 1 or 0 runs in each of his first 4 starts (3/29- 4/15, 1.23 ERA, 3 ER/22.0 IP), matching a career-long streak at any point during a season ... Surpassed later in 2018 (career-long 9 starts, 6/24-9/16) ... Prior to 2018, had not strung together consecutive starts with 1 or 0 runs allowed to begin a campaign ... Became 1 of 4 Red Sox to allow 1 or 0 runs in each of his first 4 starts of a season as a member of the Opening Day rotation (since 1908) ... The others are Cy Young (4, 1908), Dutch Leonard (6, 1914), and Roger Clemens (4, 1991) ... Recorded a career-high-tying 15 SO with 0 BB over 9.0 IP on 5/11 at TOR ... Struck out all 6 batters faced in the 4th and 5th innings, matching his career high for consecutive SO in a game (also 8/26/16 with CWS vs. SEA) ... Joined Pedro Martinez (4 times) and Roger Clemens (3 times) as the only Red Sox ever with 15+ SO and 0 BB in a start ... Was the 10th pitcher in Red Sox history to strike out 6+ straight batters in a game (source: STATS) ... Allowed 3 runs or fewer in each of his first 11 starts (2.17 ERA, 17 ER/70.2 IP) ... Prior to Sale, the last Red Sox with such a streak to begin a season was Pedro Martinez, who did so in 1999 (12), 2000 (13), and 2001 (12) ... Recorded 60 SO over 6 starts in June, the most SO by a Red Sox during the month in the last 100 seasons ... Posted a 2.11 ERA (15 ER/63.1 IP) in 12 home starts ... Allowed 0 runs and struck out 10+ batters in 3 consecutive starts at Fenway Park from 6/24-7/27, the longest such streak in the venue's 107-year history ... Became 1 of 3 ML pitchers in the last 100 seasons with 3 consecutive home starts with 10+ SO and 0 R, joining Randy Johnson (1998 SEA) and Sandy Koufax (1965 LAD) ... Recorded 11+ SO and issued just 1 BB in each of his 5 starts from 6/19-7/11 ... It marked the longest such streak in MLB history (source: Elias) ... Prior to Sale, no pitcher had even done that in 4 straight starts ... Made his 50th start with BOS on 6/30 at NYY...His 2.72 ERA in those games is the 3rd-lowest for a pitcher through 50 starts with the Red Sox since 1920, trailing only Pedro Martinez (2.59; 1998-99) and Tex Hughson (2.53; 1941-43) ... In that start on 6/30, struck out 11 Yankees with 1 hit and 1 BB over 7.0 scoreless innings ... Began his 35.0-inning scoreless streak in the 3rd inning on 7/6 at KC ... Made his 200th career start on 7/11 vs. TEX ... His 1,628 SO in those games are the most ever through 200 career starts (source: Elias) ... The previous record was held by Pedro Martinez (1,600) ... Recorded a Red Sox-record 188 SO prior to the All- Star Game, surpassing Roger Clemens' 186 in 1988 ... Mark the most since Randy Johnson's 202 with ARI in 2001, and most by an AL pitcher since Nolan Ryan's ML-record 234 with CAL in 1977 ... Also set a Red Sox record for the highest SO/9.0 IP ratio (13.12) before the ASG ... Is the 3rd-highest in ML history (min. 15 GS) ... Trails only Randy Johnson in 2001 (13.70) and Kerry Wood in 1998 (13.40) ... Started MLB's 89th All-Star Game on 7/17 at Nationals Park (1.0 IP, H, SO) ... Allowed a leadoff single to Javier Báez, then retired Nolan Arenado (F7), Paul Goldschmidt (SO), and Freddie Freeman (F8) ... Made 4 consecutive scoreless starts of 5.0+ IP from 7/11-8/12 ... Joined Pedro Martinez (2002), Luis Tiant (1972), and Ray Culp (1968) as the only Red Sox with such a streak in the last 100 seasons ... Limited his opponent to 3 hits or fewer in the final 3 outings of that streak ... Joins Pedro Martinez (3, 2002) as the only Red Sox with 3 consecutive scoreless starts of 5.0+ IP with 3 hits or fewer allowed since at least 1908 ... In 10 starts from 6/8-8/12, went 7-1 with a 0.69 ERA (5 ER/65.0 IP) ... Limited opponents to a .147 AVG (33-for- 225) in those outings (0.69 WHIP, 109 SO, 12 BB) ... Per Elias, Sale is the only ML pitcher with 100+ SO and 5 ER or fewer allowed over any 10-start span since ER were officially tracked (1912 in NL, '13 in AL) ... Recorded 10+ SO in 8 of those outings ... Recorded his 200th SO of the season on 7/27 vs. MIN ... Needed only 136.1 IP to reach 200 SO, breaking his own record (141.0 IP in 2017) as the quickest to reach that mark in AL history (source: Elias) ... Was placed on the 10-day disabled list on 7/31 (retro to 7/28) with mild left shoulder inflammation ... Returned from the DL on 8/12 ... Started that day at BAL ... Had 12 SO with 0 BB and 1 H over 5.0 scoreless IP ... Threw just 68 pitches on 8/12 at BAL ... Is the only ML pitcher in the last 100 seasons to finish a start with 12+ SO on 70 or fewer pitches ... From 7/11-8/12, became the 5th Red Sox starter since 1908 with 4 straight scoreless starts ... Joined Pedro Martinez (4 in 2002), Luis Tiant (4 in 1972), Ray Culp (4 in 1968), and Rube Foster (4 in 1914) ... Was placed on the DL on 8/18 (retro to 8/15) with mild left shoulder inflammation ... Activated from the DL on 9/11 and started that day vs. TOR ... Threw 1.0 scoreless inning (H, HBP, 2 SO) ... Logged 3.0 scoreless IP on 9/16 vs. NYM (H, SO) ... On 9/21 at CLE, threw 3.0 scoreless innings before giving up 2 runs in the 4th, 1 on a solo HR by Josh Donaldson ... That snapped his scoreless streak at 35.0 IP and his homerless streak at 74.0 IP ... POSTSEASON: Made 3 starts and 2 relief appearances, going 1-0 with a 4.11 ERA (7 ER/15.1 IP, 24 SO) ... His average of 14.09 SO/9.0 IP is the highest ever for a pitcher in a single postseason (min. 15.0 IP) ... Started Game 1 of the ALDS vs. NYY and earned his 1st career postseason win (5.1 IP, 5 H, 2 R, 2 BB, 8 SO) ... Pitched a perfect 8th inning of relief in Game 4 of the ALDS at Yankee Stadium ... Started Game 1 of the ALCS, his lone appearance of the series (4.0 IP, 1 H, 2 R, 4 BB, 5 SO) ... Started Game 1 of the World Series and earned no decision (4.0 IP, 5 H, 3 R, 2 BB, 7 SO) ... Closed out the World Series by striking out the side in the 9th inning of Game 5 at Dodger Stadium. In his debut season with the Red Sox, finished 2nd in AL Cy Young Award voting and 9th in AL MVP voting...Earned a 6th consecutive All-Star Game selection, starting for the AL...His 2nd-place finish in AL Cy Young Award voting was the highest of his career...Received two 1st-place votes and 28 2nd-place votes for 126 points (Kluber-204)...Went 17-8 with a 2.90 ERA (69 ER)...Led MLB with 308 SO, a 12.93 SO/9.0 IP ratio, and 214.1 IP...His 308 SO were the most ever by a Sox LHP in a season, 2nd-most by any Sox pitcher (Martinez, 313 in 1999)...Ranked among AL leaders in ERA (2nd, 2.90), opponent AVG (2nd, .208), opponent OPS (3rd, .603), WHIP (2nd, 0.97), BB/9.0 IP (2nd, 1.81), and wins (T-4th, 17)...Posted the 35th 300-SO season since 1900 (source: Elias)...Named a finalist for a Rawlings Gold Glove Award. Named Red Sox Pitcher of the Year by the Boston Baseball Writers...His 12.93 SO/9.0 IP ratio is the 3rd-highest in ML history behind Randy Johnson (13.41 in 2001) and Pedro Martinez (13.20 in 1999)...Struck out 36.2% of batters faced, the 3rd-highest mark ever for a starting pitcher behind Pedro Martinez (37.5% in 1999) and Randy Johnson (37.4% in 2001)... Recorded 10+ SO in a ML-high 18 starts, the most in a season by any pitcher since Randy Johnson in 2001 (23)...Also led MLB with 8 starts of 12+ SO...The only other Red Sox pitcher with as many starts in a single season is Pedro Martinez (11 in 1999)...Led MLB with 10 scoreless starts, joining Babe Ruth (10, 1916) and Pedro Martinez (10, 2000 & '02) as the only Red Sox pitchers since 1913 with as many as 10 scoreless starts in a single season...Tossed 6.0+ IP in each of them, and 7.0+ in 8 of them...Pitched 7.0+ scoreless innings with 3 or fewer hits allowed in 5 of his starts, most in the majors...His 191 SO on the road-and 13 double-digit SO efforts on the road-were the most for any pitcher in a single season since at least 1913...Pitched 7.0+ innings and allowed 3 ER or fewer in each of his first 7 home starts from 4/5-7/15 (2.45 ERA)... Since earned runs became an official stat in 1913, no other pitcher has begun a Red Sox career with even 5 consecutive home starts of 7.0+ IP and 3 or fewer ER...Went 9-5 with a 2.33 ERA (32 ER/123.2 IP) and 13.97 SO/9.0 IP in 18 starts against AL East clubs...Had 192 SO vs. AL East clubs, the highest single-season total ever against the division and the most vs. any division since J.R Richard's 193 with HOU vs. the NL West in 1978...Tossed 7.0+ innings and allowed 2 or fewer ER in each of his first 6 starts of the season, joining Dave 'Boo' Ferriss (8, 1945) and Ernie Shore (6, 1914) as the only pitchers to begin a Red Sox career with such a streak since earned runs became an official stat in the AL in 1913...Threw 7.0+ innings and allowed 4 or fewer hits in each of his first 4 starts...Is the only pitcher since 1913 to begin a Red Sox career with 4 such starts, and the 1st Red Sox pitcher to begin any season like that since Pedro Martinez in 2000 (first 5)...Began his Red Sox career with 12.0 scoreless innings...Allowed 3 hits in 7.0 IP in his BOS debut on 4/5 vs. PIT and held the Tigers scoreless through 5.0 IP on 4/10 at DET. Earned his 1st win with BOS on 4/15 vs. TB (7.0 IP, 3 H, R, 3 BB, 12 SO)...According to Elias, his 12 SO were the most ever by a pitcher in his 1st win with the Red Sox, surpassing the previous record of 11 held by Don Aase (1977), Pedro Martinez (1998), and Hideo Nomo (2001)...Had 13 SO over 8.0 scoreless IP on 4/20 at TOR, the highest single-game SO total ever by a BOS pitcher at TOR...Totaled 101 SO in his first 10 starts...Joined Randy Johnson, Pedro Martinez, Curt Schilling, and Roger Clemens as the only pitchers since 1900 with 100+ SO through the first 10 starts of any season (source: Elias)...Went 7-0 in 8 starts from 5/2-6/10...Threw a CG in the Sox' 1-0 loss at PHI on 6/15 (8.0 IP, 10 SO)...Became the 3rd Sox pitcher since 1913 with 10+ SO in a 1-0, complete-game loss (also Tim Wakefield on 9/11/05 at NYY and Pedro Martinez on 5/6/00 vs. TB)...Started the 88th All-Star Game on 7/11 at Marlins Park in Miami and threw 2.0 scoreless innings in the AL's 2-1, 10-inning victory... Set a Red Sox record with 12 double-digit SO games prior to the All-Star Game, breaking Pedro Martinez's previous record of 11...Had 178 SO prior to the break, the 3rd-highest total in club history behind Roger Clemens (186 in 1988) and Pedro Martinez (184 in 1999)...Went 6-4 with a 3.12 ERA (30 ER/86.2 IP) in 14 starts after the All-Star break...Gave up 13 ER over 8.0 IP in 2 starts vs. CLE (8/1 & 8/24), but posted a 1.94 ERA (17 ER/78.2 IP) in his other 12 starts after the break...7 of his 14 starts after the break were scoreless... Allowed 0 runs in his first 3 starts out of the All-Star break, the longest stretch of scoreless starts in his career (7/15 vs. NYY, 7/21 at LAA, 7/26 at SEA)...Threw 26.0 consecutive scoreless innings on the road from 7/6-8/13, allowing 0 runs in 3 straight starts at LAA, SEA, and TB...In his 1st start after the All-Star break on 7/15 vs. NYY, struck out 13 Yankees while allowing 3 hits over 7.2 scoreless IP...Became the only BOS pitcher since 1913 with 13+ SO and 3 or fewer hits in a scoreless start vs. NYY...Recorded his 200th SO on 7/21 at LAA, his 20th start...According to Elias, became the 4th pitcher ever with 200+ SO within the first 20 starts of a season (also Nolan Ryan in 1977, Randy Johnson in 1999-2001, and Pedro Martinez in 2000) ...Reached 200 SO in only 141.1 IP, the fewest innings needed to hit that mark in AL history (source: Elias)...Reached 250 SO on 8/19 vs. NYY, his 25th start...Joined Randy Johnson (1997, '99-'01) and Pedro Martinez (2000) as the only pitchers ever to reach 250 SO in their first 25 games of a season (source: Elias)...On 8/29 at TOR, recorded his 1,500th career SO in the 2nd, reaching the mark in the fewest IP (1,290.0 IP) in ML history (source: Elias)...Struck out 13 in 8.0 scoreless IP on 9/20 at BAL, reaching 300 SO for the year (W, 4 H, 0 BB). POSTSEASON: Started Game 1 of the ALDS at HOU and was dealt the loss (5.0 IP, 9 H, 7 R, BB, 6 SO)...Surrendered 2 ER over 4.2 relief IP in Game 4 of the ALDS vs. HOU and received the loss (4 H, 6 SO). Finished 5th in AL Cy Young Award voting and 16th in AL MVP voting...Led the majors with 6 complete games...Went 17-10 with a 3.34 ERA (84 ER/226.2 IP) and 233 SO in 32 starts. Was named to his 5th consecutive All-Star Team, joining Billy Pierce (1955-59) as the only pitchers in White Sox history to accomplish that feat. Was 17-6 with a 2.77 ERA (63 ER/205.0 IP) in 28 starts vs. AL teams, including 7-0 with a 1.52 ERA (9 ER/53.1 IP) in 7 starts against the AL East...Went 5-0 with a 0.94 ERA (4 ER/38.1 IP) in AL East ballparks. Set career highs in innings, starts, and complete games, and matched his career bests in wins (also 2012) and quality starts (23; also 2013 and 2015). Ranked among AL leaders in SO (T-2nd), ERA (9th), WHIP (3rd, 1.04), SO/9.0 IP (6th, 9.3), SO/BB ratio (3rd, 5.18), innings (3rd), quality starts (T-3rd), BB/9.0 IP (4th, 1.79), wins (T-4th), and opponent AVG (5th, .227), OBP (6th, .279), SLG (7th, .372), and OPS (7th, .651). Struck out 200+ batters for a franchise-record 4th consecutive season, joining Max Scherzer (2012-16) as the only active pitchers to acccomplish the feat...His 233 SO were the 6th-highest total in CWS history. His 6 CG were the most by a White Sox pitcher since Bartolo Colon threw 9 in 2003 and the most by a CWS lefty since Floyd Bannister threw 11 in 1987...Became the 1st White Sox pitcher to lead the majors in complete games since Jack McDowell (13) in 1992. Recorded 200.0 IP and 30 starts for the 3rd time in his career (also 2013 and 2015). Went 14-3 with a 3.38 ERA (47 ER/125.0 IP) in the 1st half and 3-7 with a 3.28 ERA (37 ER/101.2 IP) after the break. Limited left-handers to a .197 AVG (25-for-127), the 6th-lowest mark in the AL. Won each of his first 9 starts, the 2nd-longest season-opening streak in franchise history behind Eddie Cicotte (12 in 1919) and tied for 8th-longest in the modern era (since 1900)...Became the 3rd ML pitcher since 1913 to win his first 9 starts of a season with an ERA of 1.58 or lower, joining Cicotte in 1919 (9-0, 0.82) and the Giants' Sal Maglie in 1952 (9-0, 1.12) (source: STATS). Won 10 straight starts from 10/2/15-5/19/16, tied for the 4th-longest streak in CWS history (source: Elias)...Only Eddie Cicotte (12 in 1919), LaMarr Hoyt (11 in 1983-84), and Ed Walsh (11 in 1906) posted longer streaks. Became the 1st pitcher in the major leagues to reach 10, 11, 12, 13, and 14 victories. Made his 3rd career Opening Day start on 4/4 at OAK (also 2013-14)...Threw his 2nd career shutout and 9th complete game on 4/15 at TB (9.0 IP, 2 H, 0 BB, 9 SO). Earned his 4th win on 4/20 vs. LAA...Joined Eddie Cicotte (1919) and Jack McDowell (1992) as the only pitchers in club history to win each of his first 4 starts of a season while issuing a total of 3 BB or fewer. On 5/13 at Yankee Stadium, threw the first 9.0-inning complete game by a CWS pitcher against the Yankees since Jim Abbott on 7/18/95 at the old Yankee Stadium...Was his 10th career complete game. Joined Ed Lopat (1951), Sal Maglie (1952), Fernando Valenzuela (1981), and Pedro Martinez (1997) as the only pitchers since 1951 to win his first 8 starts with a sub-2.00 ERA (source: Elias). Threw his 2nd consecutive complete game on 5/19 vs. HOU...Became the 1st CWS pitcher to throw consecutive complete games since Jake Peavy from 4/23-28/12...Also became the 1st Sox pitcher since Jack McDowell in 1991 to record 3 complete games over his first 9 starts of the season. His streak of 518 consecutive lefties faced without yielding a HR (dating back to Brennan Boesch on 9/12/12 at DET) ended on Eric Hosmer's solo shot in the 1st on 6/10 vs. KC...Hosmer added another solo shot in the 4th to join Ryan Raburn (9/7/15 vs. CLE) as the only players with multi-homer efforts vs. Sale. Joined Wilbur Wood (3 times) as the only CWS pitchers to win 14+ games in the 1st half of a season. On 7/12 at SD, became the 5th pitcher in CWS history to start the Midsummer Classic, joining Billy Pierce (1953, '55-56), Early Wynn (1959), Esteban Loaiza (2003), and Mark Buehrle (2005)...Gave up 1 run in 1.0 IP (Kris Bryant HR). Received a no-decision on 7/18 at SEA despite allowing just 1 hit over 8.0 scoreless IP. Was scratched from his scheduled start on 7/23 vs. DET and suspended 5 games by the White Sox for violating team rules, insubordination, and destroying team equipment...Was reinstated from the suspended list on 7/28 and made the start that night at Wrigley Field. Led the AL with 52 SO in August. Threw 8.0+ innings in a career-high 6 straight starts from 8/20-9/16, the longest streak by a CWS pitcher since Jack McDowell went 7 in a row from 7/10-8/8/94 (source: STATS). Had 14 SO and 0 BB in the White Sox' 3-1 loss to SEA on 8/26...Joined Randy Johnson as the only pitchers in ML history to record multiple games with 14+ SO and 0 BB in a team loss (also 6/19/15 vs. TEX) (source: Elias). Recorded an American League-best and franchise-record 274 strikeouts, breaking the previous mark of 269 set by Hallof-Famer Ed Walsh in 1908 … set the new Sox record in just 208.2 IP, compared to 464.0 for Walsh. ... Walsh's 107-year old franchise record was the longest standing strikeout mark among existing franchises in the modern era (1901-) and was tied with Rube Waddell (1908 St. Louis Browns) for the third-oldest strikeout mark in combined franchise history, trailing only Christy Mathewson (1903 Giants) and Waddell (1904 Athletics). His 274 strikeouts were the third-highest total by a majorleague left-hander since 2004, trailing Clayton Kershaw (301 in 2015) and Randy Johnson (290 in 2004). n Became the first pitcher since Hall-of-Famer Pedro Martinez in 2002 to lead the AL in both strikeouts and strikeout-towalk ratio (6.52). ... Struck out 200-plus batters for the third consecutive season, joining Walsh (1910-12) as the only pitchers in Sox history to accomplish the feat … recorded 200.0-plus IP and 30-plus starts for the second time in his career (also 2013). n His average of 11.92 strikeouts per 9.0 IP set a Sox record and was the highest in the majors since Johnson's 13.41 mark in 2001 … his 6.51 strikeout-to-walk ratio (274 SO/42 BB) broke his own club record of 5.33 set in 2014. ... Led the AL with an average of 107.2 pitches per start and ranked among the leaders in numerous other categories. ... Struck out 10-plus batters 13 times, breaking his own franchise record of eight set in 2014 … became the first pitcher since Randy Johnson in 2004 to record double-digit strikeouts 13 times in one season (STATS). ... Was named to his fourth straight ALAll-Star Team after going 8-4 with a 2.72 ERA (39 ER/119.1 IP) and 157 strikeouts in 17 starts before the break … his 157 strikeouts were a club first-half record, breaking the mark of 143 set by Wilbur Wood in 1973. ... Joined LHP Billy Pierce (1955-59) as the only pitchers in White Sox history to make at least four straight All-Star Teams … did not pitch in the Midsummer Classic at Cincinnati. ... Went 5-7 with a 4.33 ERA (43 ER/89.1 IP) and 117 strikeouts in 14 starts after the break. ... Was 3-0 with a 1.20 ERA (4 ER/30.0 IP), 48 strikeouts and 16 hits allowed in four interleague starts, upping his career record to 6-0 with a 1.87 ERA (19 ER/91.2 IP) and 120 strikeouts in 19 games (11 starts) vs. the National League. ... Sox went 16-15 in his starts … 23 of his 31 starts (74.2 percent) were quality … lasted at least 7.0 IP 20 times. ... Left-handers batted .250 (32-128), up from his .165 average in 2014 and his career mark of .194 entering the season. ... Went 1-4 with a 7.36 ERA (27 ER/33.0 IP) and .319 (46-144) opponents average in six starts vs. Minnesota, compared to 12-7 with a 2.66 ERA (52 ER/175.2 IP) and .214 (139-650) opponents average vs. the rest of baseball. ... Missed spring training and began the season on the disabled list with an avulsion fracture of his right foot suffered on 2/27 … was reinstated on 4/12 and made his debut that day vs. Minnesota, allowing one run with eight strikeouts over 6.0 IP. ... Went 2-1 with a 5.93 ERA (18 ER/27.1 IP) over his first five starts and 6-3 with a 1.76 ERA (18 ER/92.0 IP) and 131 strikeouts over his next 12 starts leading into the All-Star Break. ... Was suspended five games by Major League Baseball for his role in a benches-clearing altercation on 4/23 vs. Kansas City (served from 5/7-11) … his two strikeouts against the Royals were his lowest total in 88 career starts. ... Allowed a career-high nine runs (eight earned) on nine hits over 3.0 IP on 4/30 at Minnesota, the shortest non rain-shortened start of his career. ... Recorded the first of his club-record 13 double-digit strikeout games on 5/12 at Milwaukee, fanning 11 over 8.0 IP … posted a no decision on 5/18 vs. Cleveland despite allowing just one run on four hits over 8.0 IP. ... Struck out 10-plus batters in eight straight starts from 5/23- 6/30, tied with Pedro Martinez (8/19-9/27/99 with Boston) for the longest streak in major-league history (Elias) … fanned 12-plus batters in five straight starts from 5/28-6/19, joining Martinez and Randy Johnson as the only pitchers to accomplish that feat. ... Recorded three straight starts of 12-plus strikeouts with one or no runs allowed from 5/28-6/8, joining Hall-of-Famer Sandy Koufax as the only major-league pitchers since 1900 to accomplish that feat (Elias). ... Became the first pitcher since 1900 to record 10-plus strikeouts in four straight starts (5/23-6/8) while increasing his total in each outing (Elias).  Struck out at least one batter in 38 straight innings from 5/28- 6/24, the longest streak in the majors since Johan Santana (39) in 2002 (Elias). ... Threw 100-plus pitches in 15 straight starts from 5/6-7/25 … threw 22.2 straight scoreless IP from 5/23-6/8, the secondlongest streak of his career (28.0, 5/6-6/2/13). ... Struck out 12-plus batters with no runs allowed in back-toback starts on 5/28-1 at Baltimore and 6/3 at Texas … joined Chan Ho Park (2000), Hideo Nomo (1995), Roger Clemens (1987), Nolan Ryan (1978) and Sandy Koufax (1965) as the only pitchers since 1965 to accomplish that feat. ... Recorded his fifth career game with no walks and 10 or more strikeouts on 5/28-1 at Batimore. ... Was named AL Pitcher of the Month for June after going 2-2 with a 1.83 ERA (9 ER/44.1 IP) and 75 strikeouts in six starts … it was his second career monthly honor (May 2012). ... His 75 strikeouts broke Juan Pizarro's franchise monthly record of 61 set in August 1961 and were the most in the major leagues since Nolan Ryan set the modern-day record of 87 with California in June 1977. ... Sale, Sandy Koufax (76 in May 1965), Sam McDowell (76 in May 1968) and Ryan (five different months) are the only pitchers in the last 100 years to record 75-plus strikeouts in a single month (STATS LLC). ... His average of 15.23 strikeouts per 9.0 IP was the thirdhighest monthly total in major-league history behind Hall-ofFamer Randy Johnson (15.79 in July 2001) and Kerry Wood (15.43 in May 1998). ... Earned his 50th career victory on 6/8 vs. Houston, allowing one run with 14 strikeouts over 8.0 IP.  Posted a no decision on 6/19 vs. Texas despite allowing just two singles with no walks and 14 strikeouts over 8.0 scoreless IP … recorded the 34th game in major-league history and first in White Sox history with 14 or more strikeouts and no walks … retired the first 17 batters.  The Sox became the fourth team in major-league history to lose a game despite having a starting pitcher throw 8.0-plus scoreless IP with 14 or more strikeouts (Elias).  Struck out 10 batters in a loss on 6/24 at Minnesota, the seventh time since 2012 that he has struck out 10 or more batters in a losing effort. ... Posted a no decision on 6/30 at St. Louis despite allowing one run on six hits with 12 strikeouts over 8.0 IP in his 100th career start … collected his only career hit in the third inning, a single off Lance Lynn. ... Went 46-30 with a 2.81 ERA (213 ER/682.2 IP) and 766 strikeouts through his first 100 career starts (Elias) … his 766 strikeouts were the most in major-league history by a pitcher through his first 100 starts, ahead of Tim Lincecum (755) and Dwight Gooden (749) … according to STATS LLC, his 2.81 ERA was the third-best mark in Sox history after 100 starts behind Red Faber (2.25) and Gary Peters (2.61). ... Registered his eighth career complete game on 7/6 vs. Toronto … pitching opposite Mark Buehrle, who also went the distance, the game lasted 1:54, the fastest in the majors since Kansas City at Tampa Bay on 8/9/11 (1:53). ... Struck out a franchise-record 29 batters in back-to-back starts on 8/21-26, fanning 14 on 8/21 at Seattle after matching his career high with 15 on 8/16 vs. the Cubs. ... Became the fifth left-hander in major-league history to record at least 15 strikeouts with one or no hits allowed on 8/16 vs. the Cubs, joining Randy Johnson (four), Clayton Kershaw, Jon Lester and Warren Spahn (one each). ... Lost four consecutive starts from 9/7-24, posting a 4.88 ERA (13 ER/24.0 IP). ... Recorded his 1,000th career strikeout (Chris Young) in the fourth inning on 9/24 at New York-AL, becoming the fifth-fastest pitcher (872.0 IP) in major-league history to reach that milestone … only Billy Wagner (757.2 IP), Octavio Dotel (820.1), Francisco Rodriguez (827.1) and Kerry Wood (853.0) reached 1,000 strikeouts in fewer IP than Sale (Elias).  Ended his four-game losing streak in his final start on 10/2 vs. Detroit (1 ER/7.0 IP) … recorded his 270th strikeout (James McCann) in the second inning to break Walsh's 107-year-old club record. Was a finalist for both the American League Cy Young Award and the Players Choice AL Outstanding Pitcher...Finished third in the Cy Young voting (78 points) behind Cleveland's Corey Kluber (169) and Seattle's Felix Hernandez (159)...Narrowly missed becoming the first White Sox pitcher to lead the AL in ERA since Joel Horlen in 1967, finishing .03 behind Hernandez...His 2.17 ERA was the lowest by a Sox pitcher since Wilbur Wood (1.91) in 1971 and the lowest by an AL lefty since Ron Guidry (1.74) in 1978...Ranked among the AL leaders in almost every category (see box at right) despite missing a month of the season with a flexor muscle strain in his left elbow...Held opponents to a .205 average, the eighth-lowest mark in White Sox history and best since Gary Peters (.199) in 1967...Struck out 208 batters, joining Ed Walsh (1907-08, '10-12), Tom Bradley (1971-72) and Javier Vazquez (2007-08) as the only pitchers in franchise history to record 200 in back-to-back seasons … his 208 strikeouts set a franchise-record by a White Sox pitcher through 26 starts of a season, seven more than the mark he set in 2013 (STATS LLC)...Set franchise records with 10.76 strikeouts per 9.0 IP and a 5.33 strikeout-to-walk ratio, breaking the club marks of 9.49 and 4.91 he set in 2013...Was named to his third straight ALAll-Star Team via the Final Vote after going 8-1 with a 2.08 ERA (22 ER/95.0 IP) and 102 strikeouts before the break … became the first Sox pitcher to accomplish the feat since Jack McDowell from 1991-93...Recorded a franchise-record eight double-digit strikeout games, tied with Max Scherzer for third-most in the majors...Fanned 12-plus batters a major-league high four times, with a season best of 13...Limited left-handers to a .165 (20-121) average with two extra-base hits (both doubles), the second-lowest mark among AL starters behind Kansas City's Danny Duffy (.137)...Also ranked second in the AL behind Duffy in opponents OBP (.211), slugging (.182) and OPS (.393)...Went 3-1 with a 1.93 ERA (16 ER/74.2 IP) in 11 starts on the road … his 1.93 road ERA would have ranked fourth in the major leagues with the minimum IP...Was 9-3 with a 2.36 ERA (29 ER/99.1 IP), 129 strikeouts and two complete games in 15 starts at U.S. Cellular Field...Went 2-0 with a 1.57 ERA (4 ER/23.0 IP) and 28 strikeouts in three starts during interleague play, including a 1-0 record with a 1.93 ERA (3 ER/14.0 IP) and 19 strikeouts in two starts against the World Champion San Francisco Giants....Went 2-1 with a 1.77 ERA (9 ER/45.2 IP) and 50 strikeouts in seven starts vs. the AL East, including a 0.00 ERA (12.0 IP) with 17 strikeouts against the Yankees...Was 1-1 with a 2.25 ERA (5 ER/20.0 IP) and 33 strikeouts in three starts vs. Detroit, fanning 10 or more in all three starts...Limited opponents to a .152 (31-204) average through his first nine starts, the lowest mark by an AL pitcher since 1971, when Oakland's Vida Blue also held the opposition to a .152 mark...His 80.8 (21-26) quality start percentage ranked fifth in the major leagues and fourth in White Sox history...Sox went 15-11 in his starts … five of his 10 no decisions resulted in starts when he left with the lead … went 5-0 with eight ND when pitching after a Sox loss … gave up five hits or less in 16 of his 26 starts … opponents were 4-8 (50.0) in stolen-base attempts … received 4.40 runs of support per 9.0 IP, up from 3.19 in 2013...Carried a no-hitter into the fourth inning in six straight starts from 4/17-6/12, including into the sixth on 4/17 vs. Boston and 5/22 vs. Yankees...Made his second straight Opening Day start on 3/31 vs. Kansas City (3 ER/7.1 IP) … threw 8.0 scoreless IP in his next start on 4/6 at Kansas City...Allowed one hit with 10 strikeouts in back-to-back starts on 4/17 vs. Boston and 5/22 vs. the Yankees, joining R.A. Dickey (6/13-18/12) as the only pitchers in the modern era to accomplish that feat (Elias)...Was on the disabled list for the first time in his career from 4/18-5/21 with a flexor muscle strain in his left arm … made one rehab start for Class AAA Charlotte on 5/16-1 at Durham, allowing one hit with 11 strikeouts over 4.0 scoreless IP...Went the distance for the sixth time in his career on 6/1 vs. San Diego (28 batters faced) … carried a three-hit shutout into the eighth inning on 6/7 at the Angels before giving up five runs without recording an out, including a grand slam to Mike Trout...Suffered his first loss on 6/12 vs. Detroit (1 ER/7.0 IP)...Did not issue a walk and struck out 10...Allowed a career-high 11 hits over 6.0 IP on 6/23 at Baltimore....Posted a 0.85 ERA (3 ER/31.2 IP) in July, the fifth-lowest by a Sox pitcher in that month since at least 1914...Recorded his seventh career complete game on 7/4 vs. Seattle and his fourth career start with no walks and 10-plus strikeouts...Gave up one run in back-to-back starts on 7/9 at Boston (7.2 IP) and 7/21 vs. Kansas City (7.0 IP) … threw 8.0 scoreless IP with no walks and 12 strikeouts on 7/26 at Minnesota...His 56 strikeouts in August tied San Francisco's Madison Bumgarner for the major-league lead and tied Javier Vazquez (9/07) for the sixth-highest monthly total in franchise history..Posted a ND on 8/12 at San Francisco despite throwing 8.0 scoreless IP...Struck out a season-high 13 on 8/30-1 vs. Detroit...Fanned 10-plus batters for the 17th time in 81 career starts, tying the club record set by Ed Walsh, who reached the mark in his 288th start...Earned his 12th and final victory on 9/11 vs. Oakland, allowing just two singles over 8.0 scoreless IP...Struck out 10 batters over 6.0 IP on 9/24 at Detroit (ND). Was named to his second consecutive American League All-Star Team (chosen by manager Jim Leyland) in his second season as a starter … established single-season franchise records in strikeouts per 9.0 IP (9.49) and strikeout-to-walk ratio (4.91) … his 226 strikeouts ranked third in the AL and were the highest total by a lefty in White Sox history … became the eighth Sox pitcher (third lefty) to strike out 200-plus batters in a season … recorded 12 or more strikeouts four times to up his career total to six, tied with Juan Pizarro and Ed Walsh for the most in Sox history … became the eighth Sox pitcher (15th time) to reach 200.0 IP and 200 strikeouts in a season and first since Javier Vazquez in 2007-08 … became the fastest pitcher in franchise history to reach 200 strikeouts in a season (193.2 IP and 27 starts) and 500 career strikeouts (472.1 IP) … his four complete games were the most by a Chicago lefty since Mark Buehrle in 2004 (also four) … received a 3.19 run support average (76 RS), the third-lowest mark in the majors … posted a 2.97 ERA at U.S. Cellular Field (40 ER/121.1 IP), the 10th-lowest mark in the AL … his .215 opponent average (95-441) at home ranked sixth … recorded a major-league best 0.87 ERA (3 ER/31.0 IP) in May … left-handers hit just .135 (20-148) with three-extra base hits (no home runs), the third-lowest average in the major-leagues behind Boston's Koji Uehara and Pittsburgh's Francisco Liriano … opponents hit just .213 (94-442) in the first half … averaged 108.3 pitches per start … worked at least 7.0 IP 23 times, going 10-8 with a 2.14 ERA (42 ER/176.1 IP) and a 3.42 RSA (67 RS) in those outings … compiled a 28.0 scoreless IP streak from 5/6-6/2, the 11th-longest streak in franchise history and longest since Wilson Alvarez went 31.0 scoreless 9/11-27/93 … earned the victory in his first Opening Day start on 4/1 vs. Kansas City, throwing 7.2 scoreless IP … surrendered eight runs in a loss on 4/13 at Cleveland … went 4-0 with a 1.18 ERA (5 ER/38.0 IP) in five starts from 4/25-5/17 … allowed two earned runs or less over 6.0-plus IP in seven consecutive starts from 4/18-6/2, the longest streak by a Sox pitcher since Gavin Floyd also went seven from 6/8-7/10/10 … recorded his first career shutout and second complete game on 5/12 vs. Los Angeles-AL, allowing just one hit while facing 28 batters … retired the first 19 batters faced, did not issue a walk and went to a three-ball count once … the shutout was the first of his career and second complete game … it was the 63rd one-hitter in Sox history and first since Zach Stewart on 9/5/11 at Minnesota … according to the Elias Sports Bureau, he became the 12th pitcher in White Sox history to throw a shutout while allowing one hit with no walks or hit batters, and just the sixth since 1958 to equal those numbers when facing 27 or 28 batters … joined St. Louis' Shelby Miller, Boston's Jon Lester and New York-NL's Matt Harvey as pitchers in May who worked 9.0 scoreless IP and allowed no more than one batter to reach base safely … it was the first time in the modern era (since 1900) that four pitchers have accomplished the feat in a single month … threw 7.2 scoreless IP in his next start on 5/17 at the Angels, allowing three hits with 12 strikeouts to extend his winning streak to four games … improved to 10-0 lifetime vs. the AL West, joining Dock Ellis (1976-77) as the only pitchers in baseball history to win their first 10 decisions vs. the division (STATS LLC) … was scratched from his scheduled start on 5/22 vs. Boston due to tendinitis in his left posterior shoulder … suffered a career-high, six game losing streak from 6/2-7/6 (seven starts) despite recording a 3.10 ERA (17 ER/49.1 IP) … received a 1.64 RSA (9 RS) during the streak … the 3.10 ERA was the lowest by a White Sox pitcher during a losing streak of six-plus games since Charlie Robertson in 1923 (six games, 2.64 ERA) … the last pitcher in baseball to reach those marks was Orel Hershiser in 1989 (seven straight losses, 2.29 ERA) … suffered the loss on 6/14 at Houston despite throwing his third career complete game, allowing one unearned run with 14 strikeouts over 8.0 IP … became just the third pitcher in the last 100 years to lose a game while striking out 14-plus and surrendering zero earned runs, joining the White Sox Jim Scott (6/22/1913) and Cleveland's Sam McDowell (7/6/68) … the 14 strikeouts tied for the seventh-highest total in franchise history and were the second-most of his career (15 on 5/28/12 at Tampa Bay) … recorded 13 strikeouts over 8.0 IP in a no decision on 6/25 vs. the Mets … became the first pitcher since Randy Johnson in 2004 to make two starts of 8.0-plus IP with 13-plus strikeouts without earning a win … snapped his losing streak on 7/11 at Detroit (3 ER/6.2 IP) … earned the victory for the AL at the 84th All-Star game on 7/16 at Citi Field … worked 2.0 scoreless IP with two strikeouts (Carlos Gonzalez and Troy Tulowitzki) … the victory was the seventh by a White Sox pitcher in the All-Star Game, the most among AL franchises and the second-most in baseball (San Francisco, 8) … surrendered just two earned runs over 8.0 IP in a loss on 7/22 vs. Detroit … the loss was his third of the season when working at least 8.0 IP … suffered the loss on 7/27 vs. Kansas City (1 ER) despite throwing his fourth career complete game … allowed two earned runs in a complete game victory on 8/12 vs. Detroit … matched his career high by allowing eight earned runs over 7.0 IP on 8/23 vs. Texas (also 4/13/13 at Cleveland) … registered his sixth double-digit strikeout game of the season on 8/28 vs. Houston, allowing one run with 12 strikeouts over 8.0 IP … recorded 12-plus strikeouts for the sixth time in his career, tying Pizarro and Ed Walsh for the club record … earned his final win on 9/9 vs. Detroit (1 ER/8.0 IP) … was charged with the loss in his 30th and final start on 9/27 vs. Kansas City … agreed to terms on a five-year, $32.5-million contract on 3/7, including club options for 2018 and 2019...T1st in complete games (4); 2nd in SO/BB ratio (4.91); 3rd in strikeouts (226) and WHIP (1.07); T4th in quality starts (23); 5th in baserunners per 9.0 IP (10.25); T5th in IP (214.1); 6th in strikeouts per 9.0 IP (9.49); 7th in ERA (3.07) and opponents average (.230). Went 17-8 with a 3.05 ERA (65 ER/192.0 IP) and 192 strikeouts in his first professional season as a starting pitcher ... was selected to his first American League All-Star team ... ranked among the AL leaders in multiple categories (see box at right) ... recorded 11 or more strikeouts four times in 2012, joining Ed Walsh (four in 1910) and Javier Vazquez (four in 2006) as the only players in White Sox history to accomplish the feat ... became the fifth White Sox pitcher to strike out 13-plus batters twice in one season (5/28 at Tampa Bay and 8/22 vs. the Yankees) ... owned an eight-game home winning streak from 5/24-9/8, tied for the third-longest in franchise history ... Johnny Rigney (1938-39) and Mark Buehrle (2008-09) share the franchise record with 12 straight home wins ... his 192 strikeouts were the most by a Sox left-hander since Floyd Bannister in 1985 (198), and his 17 wins were the most since Buehrle in 2002 (19) ... went 11-3 (.786) following a White Sox loss, tied with Philadelphia's Cole Hamels for the best mark in the Majors... was 9-3 with a 2.30 ERA (24 ER/94.0 IP) at home and 8-5 with a 3.77 mark (41 ER/98.0 IP) on the road ... his 9.0 strikeouts per 9.0 IP (1st) and 3.76 strikeout-to-walk ratio (6th) rank among Chicago's single-season franchise leaders ... ranked among AL home leaders in ERA (3rd), winning percentage (5th, .750), wins (t5th, 9) and opponents average (7th, .215) ... was 10-2 with a 2.19 ERA (25 ER/102.2 IP) and a .198 (73-368) opponents average in the first half and 7-6 with a 4.03 mark (40 ER/89.1 IP) after the break ... made 19 quality starts and worked at least 7.0 IP 13 times ... lefties hit .233 (45-193) with two home runs while righties were at .236 (122-518) with 17 homers ... limited the opposition to a .169 (26-154) average with RISP and a .199 mark (48-241) the first time through the lineup (.253 the rest of the game) ... was named AL pitcher of the Month for May after going 4-1 with a 1.71 ERA (6 ER/31.2 IP), 35 strikeouts and a .181 (21-116) opponents average over six games (five starts) ... the award was his first career monthly honor ... allowed three runs or less over his first 11 starts, joining Gary Peters (16 starts, 1963), Cisco Carlos (13, 1967-68) and Fred Klages (12, 1966-67) as the only pitchers in franchise history to accomplish the feat ... went 6-0 with a 2.65 ERA (16 ER/54.1 IP) over his first nine road starts from 4/9-7/15 ... earned the win in his first career start on 4/9 at Cleveland (1 ER/6.2 IP) ... struck out 11 in a victory on 4/20 at Seattle (3 ER/6.1 IP) ... was moved to the bullpen on 5/4 after experiencing tenderness in his left elbow ... suffered a blown save in his only relief outing on 5/8 at Cleveland (1 ER/1.0 IP) ... was moved back into the rotation on 5/12 and started that night vs. Kansas City (l, 3 ER/5.0 IP) ... compiled an eight-game winning streak from 5/17-7/15, tied for the third-longest in the AL during the season and tied for the second-longest by a White Sox first-year starter since 1919 (STATS LLC) ... allowed just one run on three hits with 15 strikeouts in a victory on 5/28 at Tampa Bay ... the 15 strikeouts tied for the second-most in franchise history (fifth time) and were the most by a Sox pitcher since Jack Harshman struck out a team-record 16 on 7/25/54 at Boston ... also set a Tropicana Field record for strikeouts, breaking the mark of 14 set by Boston's Pedro Martinez on 7/7/99 ... became the youngest AL pitcher (23 years, 59 days) to record 15 or more strikeouts since Greg Swindell (5/10/87) and the youngest in the Majors since Mark Prior registered 16 on 6/26/03 ... threw his first career complete game on 6/3 vs. Seattle, allowing two runs on five hits with eight strikeouts and two walks ... worked 8.0 scoreless IP in a victory on 6/9 vs. Houston ... received a no-decision on 6/22 vs. Milwaukee despite throwing 8.0 scoreless IP ... reached 200 career strikeouts in 182.2 IP, tied with Cole Hamels for the fourth-fewest IP to reach the mark among active pitchers (source: STATS LLC) ... allowed two runs or less in 7.0 IP or more in three consecutive wins on 6/27 at Minnesota (2 ER/7.0 IP), 7/3 vs. Texas (1 ER/7.1 IP) and 7/15 at Kansas City (1 ER/8.0 IP) ... worked 1.0 scoreless IP at the All-Star Game in Kansas City ... his eight-game winning streak ended on 7/21 at Detroit (5 ER/7.0 IP) ... struck out 11 over 6.2 IP in a victory on 8/12 vs. Oakland ... earned the win on 8/22 vs. the Yankees, allowing one run over 7.2 IP with 13 strikeouts ... suffered the loss in his final start of the season on 9/29 vs. the Rays (5 ER/3.1 IP), snapping his eight-game home winning streak. Went 2-2 with a 2.79 ERA (22 ER/71.0 IP), eight saves and 79 strikeouts in his first full Major-League season ... his 71.0 IP in relief led the team and were the most by a White Sox left-hander since Matt Thornton worked 72.1 in 2009 ... ranked among the American League relief leaders in IP (6th), strikeouts (6th), strikeouts per 9.0 IP (8th, 10.01) and inherited runners scored percent (8th, 18.4) ... converted 8-10 save opportunities and recorded 16 holds, third-most on the team behind Jesse Crain (24) and Matt Thornton (20) ... posted a 1.66 ERA (10 ER/54.1 IP) over his final 41 outings, lowering his season mark from 6.48 to 2.79 ... held right-handers to a .199 (27-136) average and lefties to a .208 (25-120) mark ... went 2-0 with a 3.47 ERA (14 ER/36.1 IP) and a .245 (34-139) opponents average in the first half and 0-2 with a 2.08 ERA (8 ER/34.2 IP) and a .154 (18-117) mark after the break ... allowed 18.4 (7-38) percent of inherited runners to score ... first batters hit .273 (15-55) ... posted a 2.04 ERA (8 ER/35.1 IP) vs. the AL Central ... recorded a 1.59 ERA (6 ER/34.0 IP) on the road and a 3.89 mark (16 ER/37.0 IP) at home ... earned both of his victories in April (4/6 at Kansas City and 4/12 vs. Oakland) but recorded his highest monthly ERA (5.91) ... tossed a career-high 3.0 scoreless IP on 5/28 at Toronto ... threw 13.2 consecutive scoreless IP from 7/24-8/16 ... surrendered his first career home run to a lefty on 8/16 vs. Cleveland (Travis Hafner) ... tied his career high with four strikeouts on 8/30 vs. Minnesota and 9/10 vs. Cleveland ... his streak of eight straight saves converted ended in the season finale on 9/28 vs. Toronto when he allowed two runs in the ninth inning ... entered the season ranked by Baseball America as the No. 1 Prospect in the White Sox organization ... also tabbed by the same publication as possessing the Best fastball, Best slider and Best changeup among Sox prospects who spent time in the Minor Leagues in 2010. Went 2-1 with a 1.93 ERA (5 ER/23.1 IP), four saves and 32strikeouts in 21 relief appearances in his first professional season ... was theonly player from the 2010 First-Year Player Draft to play in the majors ... alsobecame the first White Sox pitcher to make his debut in the same year hewas drafted since Alex Fernandez in 1990 ... was 4-4 in save opportunities(3-3 vs. American League Central opponents) ... 18 of his 21 appearanceswere scoreless ... averaged 12.3 strikeouts per 9.0 IP ... opponents batted.185 (15-81), with left-handers at .290 (9-31) and righties at .120 (6-50) with23 strikeouts ... allowed 23.1 percent (3-13) of inherited runners to score ...first batters hit .105 (2-19) ... his contract was purchased from Class AAACharlotte on 8/4 ... did not retire either batter faced in his major-league debuton 8/6 at Baltimore ... made five straight scoreless appearances to begin his career before suffereing the losson 8/21-1 at Kansas City (1 ER/1.2 IP) ... earned his first major-league save on 9/1 at Cleveland and first win on9/6 at Detroit with a career-high 2.2 scoreless IP ... struck out a career-high four batters on 10/3 vs. Cleveland... issued one walk and struck out 16 over his final 10 outings (12.1 IP) ... was named The Sporting News MinorLeague Rookie of the Year (players drafted in 2010) after going 0-0 with a 2.61 ERA (3 ER/10.1 IP) and 19strikeouts in 11 relief outings between Class A Winston-Salem and the Knights ... was listed by Baseball Americaas the No. 4 overall prospect in the 2010 draft and possessing the Best Command and being the Second-Closestto the Majors among draft-eligible college players ... was recommended/signed by Jose Ortega. 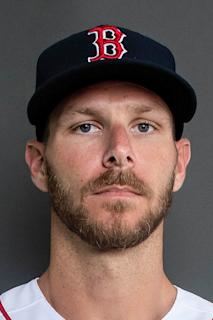 September 11, 2018 Boston Red Sox activated LHP Chris Sale from the 10-day injured list. August 18, 2018 Boston Red Sox placed LHP Chris Sale on the 10-day disabled list retroactive to August 15, 2018. Mild left shoulder inflammation. August 12, 2018 Boston Red Sox activated LHP Chris Sale from the 10-day disabled list. July 31, 2018 Boston Red Sox placed LHP Chris Sale on the 10-day disabled list retroactive to July 28, 2018. Mild left shoulder inflammation. July 28, 2016 Chicago White Sox activated LHP Chris Sale. July 24, 2016 LHP Chris Sale roster status changed by Chicago White Sox. May 12, 2015 Chicago White Sox activated LHP Chris Sale. May 7, 2015 LHP Chris Sale roster status changed by Chicago White Sox. April 12, 2015 Chicago White Sox activated LHP Chris Sale from the 15-day disabled list. April 5, 2015 Chicago White Sox placed LHP Chris Sale on the 15-day disabled list retroactive to March 27, 2015. Avulsion fracture of right foot. May 22, 2014 Chicago White Sox activated LHP Chris Sale from the 15-day disabled list. May 15, 2014 Chicago White Sox sent LHP Chris Sale on a rehab assignment to Charlotte Knights. August 4, 2010 Chicago White Sox selected the contract of LHP Chris Sale from Charlotte Knights. July 14, 2010 Chris Sale assigned to Charlotte Knights from Winston-Salem Dash. June 23, 2010 Chris Sale assigned to Winston-Salem Dash from Chicago White Sox. June 22, 2010 Chicago White Sox signed LHP Chris Sale.